Rene Shoemaker has had exhibits in London and Paris this year. But on Sunday, the artist will open one at the Columbus Museum. 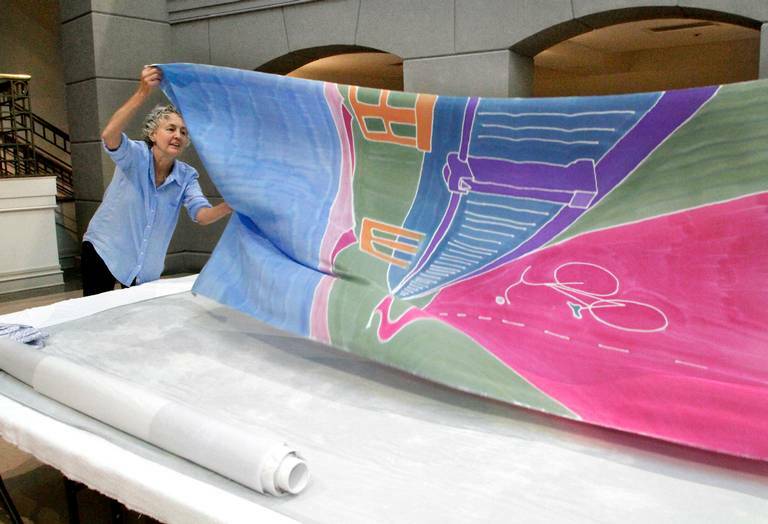 "Discovering the Chattahoochee Valley: Silk Paintings by Rene Shoemaker," an exhibit of large-scale silk paintings, runs in the Galleria until next July. "Using silk as my canvas, and dye as my paint, I describe a sense of place through extraordinary colors," Shoemaker said on her website. "A degree in fabric design, life experience, and a love of travel and quiet places all merge together to create beautiful images for you." The Athens, Ga., resident said her mission is to bring beauty into the lives of people she has met and those who she hopes to meet. The artist created site-specific works about the Chattahoochee Valley after visiting the area and making sketches of local buildings, spaces and people. In addition, Shoemaker solicited responses from the community through social media to decide which buildings and locations could be used in the paintings. Shoemaker said on the museum's website that the exhibit is "about discovering what makes the city and valley unique to its citizens and visitors. For this project, the University of Georgia graduate used silk twill, a midweight silk that billows gently as the air moves.